Crime Watch: Rapace for Best Actress? Back in August last year I reported on rumours coming out of Hollywood that Noomi Rapace could be in the running for an Oscar nomination for her tremendous portrayal of Lisbeth Salander in the Swedish-language film adaptation of Stieg Larsson's books. Along with speculation that the makers of the English-language version might try to dampen any such hype, in case it damaged their own film. I think, if all things were equal (which they never are in the entertainment world), Rapace would be a worthy shoo-in for at least an Oscar nomination. However it remains to be seen whether Hollywood would/will embrace the foreign-language performance. Rapace was overlooked by the Golden Globe Awards (I'm not sure whether her and the film were eligible, depending on their criteria) - Natalie Portman (BLACK SWAN) won Best Actress in a Drama ahead of four other English-language performances - but today comes welcome news that Britain's own film awards, the BAFTAs, have lined up Rapace as a deserved nominee in the Best Actress category. Joining Rapace and Portman in the Best Actress category for the BAFTAs are Annette Bening and Julianne Moore (THE KIDS ARE ALRIGHT), along with Hailee Steinfeld (TRUE GRIT). Moore and Bening were both nominated in the Best Actress - Comedy or Musical category at the Golden Globes (Bening won the category), where like Rapace, Steinfield was overlooked by the Hollywood Foreign Press. It's kind of interesting that in fact the BAFTA list only includes three of the ten Best Actress nominees (Drama and Comedy/Musical) from the Golden Globes. The Academy Award (Oscar) nominations will be announced next week. It would be fantastic (and deserved) to see Rapace on the list, but I'm not that hopeful of the American academy sharing the foresight of their British counterparts, even though there is some overlap between the bodies. A shame. In its latest 'Oscar predictions' rankings, Entertainment Weekly lists Rapace at number 10 for Best Actress, with bigger names (which may be preferred by the often-conservative American academy voters) and previous Oscar nominees and winners such as Hilary Swank, Michelle Williams and Nicole Kidman 'above' her (Halle Berry was also rated above her until the BAFTA nominations). As I said in my review of Män som hatar kvinnor (aka the Girl with the Dragon Tattoo) in December 2009: "In terms of acting, I thought Noomi Rapace was brilliant as Lisbeth Salander. She conveyed the computer hacker’s conflict, confusion, anger, and uniqueness (amongst other things) exceptionally well through glances, gestures, and other non-speaking moments – not just scripted dialogue. 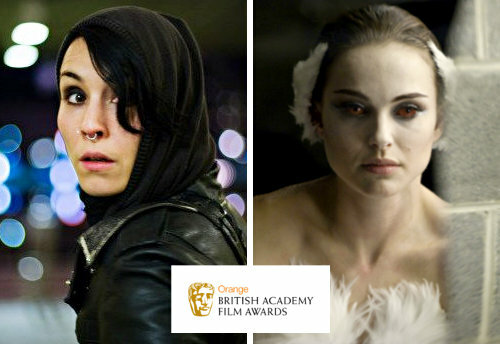 Like the best performances, I never saw it as someone acting as Lisbeth Salander, rather Rapace was Lisbeth Salander. " Read the full review here. What do you think of Rapace's performance as Salander (especially in the first film, which is eligible for this year's Oscars etc)? Do you think she deserves to be nominated? How does her performance compare to some of the other strong female acting performances of 2010? I haven't seen it yet, but I will shortly.